Right turn signal . With ignition switched off move from central position for right parking light . Left turn signal . With ignition switched off move from central position for left parking light . Switch on the main beam . When the main beam is switched on, an indicator lamp in the instrument cluster lights up. Operate the headlight flasher or switch off the main beam. The headlight flasher comes on for as long as the lever is pulled. The indicator lamp lights up. Return the lever to the basic position to switch off the current function. 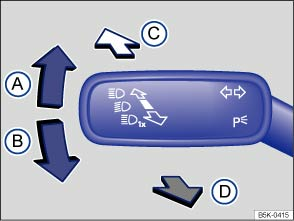 To operate the lane change flash, push the lever up or down to the point where you incur resistance and then release the lever. The turn signal flashes 3 times. The lane change flash can be activated and deactivated using the button and the and Light function buttons in the infotaniment system . Incorrect use of turn signals, a failure to use turn signals, or forgetting to switch off a turn signal can confuse other road users. This can lead to accidents and serious injuries. Always activate the turn signal in good time when changing lanes and performing overtaking or turning manoeuvres. Always switch off the turn signal once the lane change or overtaking or turning manoeuvre has been completed. Incorrect use of the main beam headlights can lead to accidents and serious injuries as the main beam headlights can distract and dazzle other road users.